As a new year approaches, I feel like there is so much to do and so much to get caught up with. Clearing out closets, getting rid of the literal and figurative baggage. Wanting to purge the unneeded and unnecessary. And I find like everything else it is a process. With in that process, at least for me is weaning myself from the excess of rich and sugary foods I indulged in over the last month. I definitely spent much of the last month eating, not necessarily from hunger, but just having cookies, linzertortes, chocolates, desserts, quiches, breads and bagels, around every corner I turned, just sitting there calling to me from the platters, inviting me to nibble, nibble nibble. Which, by the way, I am planning on a separate holiday post, with recipes, photos and stories. quite a few walks, including one adventure through the woods, but I have pretty much fallen of the wagon in terms of exercise. So with the intentions of getting back on track with healthier eating, here is a simple and quick recipe I made last night for Zsuleikah and I. I omitted the red pepper flakes from the sauce, for her sake, but here I will include them. And also to accommodate for her picky tastes, I didn't mix everything together, but put it separately. I cant wait for the day my kiddo is no longer picky. Happy New Year to Everyone! May you realize your dreams and wishes and incorporate your needs and desires into your busy life. Step 1: Cook pasta as directed on the package. While pasta is cooking prepare the other items. After pasta is done cooking, be sure to toss lightly with a dab of EVOO, so it doesn't get sticky. Step 2: In a small saucepan, slightly heat 2 Tbl. spoons of EVOO. Add in the onions and sauté until translucent. Add in the garlic. Sauté another 1 minute. Add in the can of diced tomatoes with the liquid (if it is very liquidy, drain some of the liquid off). Add in the spices. Let simmer uncovered on low until meal is ready to be tossed together. Step 3: In a large skillet, add 1 Tbl. spoon of EVOO. Heat slightly over medium heat and add kale. Sauté, stirring frequently until kale is deeper in color and soft (about 5 minutes). Transfer the kale to a large bowl and cover. Step 4: In the same skillet as you cooked the kale, add the last tsp of EVOO, add the sausage (You choose to chop prior to use, remove from casing or cook whole. I cooked mine whole then sliced it into crescents.) Cook sausage over medium high heat until browned on all sides and cooked thoroughly about 10-12 minutes. Step 5: When all ingredients have been cooked. 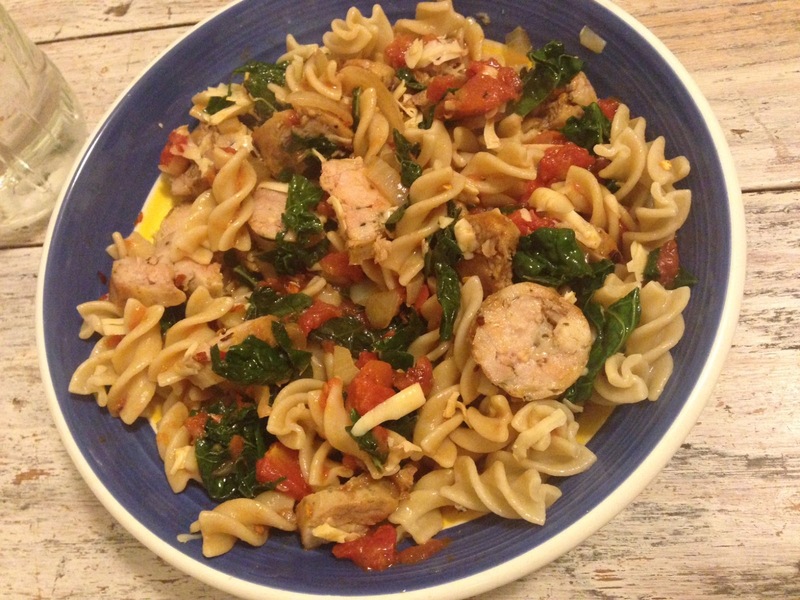 Mix the pasta, sauce, kale and sausage in the pasta pot. Toss well. Serve into individual bowls and top with grated smoked gouda cheese. December has kept us going, what feels like non-stop. At the beginning of the month, we trekked out into the forest, through a good four inches or more of crust laden snow, in the rain and sleet to find our Christmas tree. Finding a woods tree is always a bit of a challenge, making sure the branches are strong enough, that it is full enough, not too big or small, and doesn't too much resemble that of Charlie Brown's tree. After about an hour or so, I found a great one and using a handsaw, brought it down. Zsuleikah enjoyed the adventure, I think her favorite part being running after the fresh fir I dragged behind me and trying to jump on its tip. The adventure however did not stop there. Once we got our three trees to my car, my friend realized, she had forgotten the rope to tie the trees on the roof. Thankfully, I had been carting arounds an old spool of kite string in my trunk and rigged it so the trees fit in the trunk and the trunk would stay closed. As anyone who has set up a tree may know, it isn't the finding it that is the most difficult part, but however getting it in the god forsaken stand and then stringing on the lights in a manner that doesn't look totally haphazard. 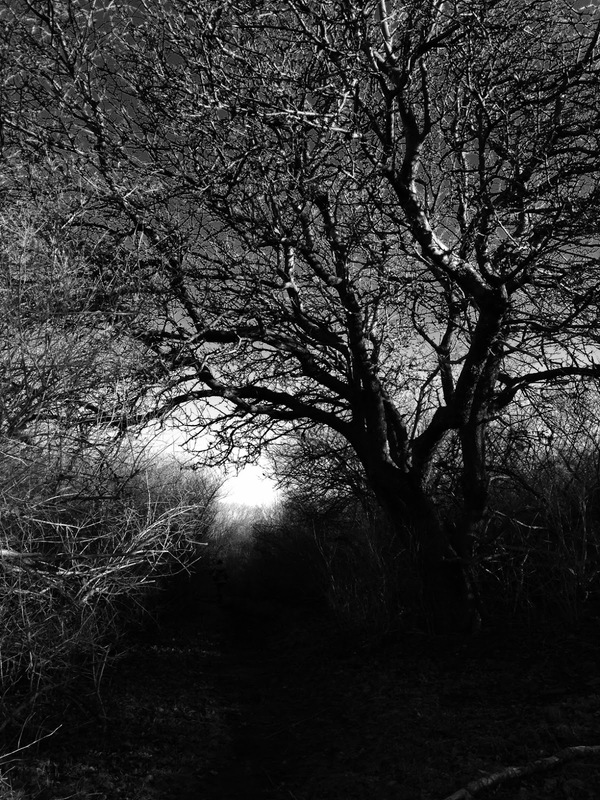 This is especially true for a tree that is from the woods, and hasn't been pruned to perfection by an arborist. After our tree adventure, I bathed Zsuleikah and showered the sap and pitch out of my hair, and it was into our best clothes for an evening at the Maine State Ballet's Nutcracker. It was our third year, and Zsuleikah enjoyed it more than ever. She is so enchanted by the sparkle, costumes, live orchestra and the marvelous ballerinas. Last weekend after being stuck inside and surrounded by the gray, rainy weather, I finally got a little reconnection with nature on a sunny Sunday afternoon walk along Black Point in Scarborough. Accessing the semi-private trail, somewhat coveted by the inn, is a little tricky at the hight of the tourist season. I love visiting it now, in the coolness of winter. Caressing the stones, smoothed by the endless tumble and churn of the waves. Listening to the chime like sound of the water pulling the stones in and out against each other, with each departure and return of the waves. Remembering that the sun, no matter how cold the air, is always a blessing, and its mid afternoon warmth on your face and back is a true medicine in the winter months. Now I am busy scrambling to get out my holiday cards, make homemade Christmas gifts, and hoping to do a little baking. I have found lots of great cookie ideas. So needless to say, time has felt really short lately. Rushing from home to daycare to work. Running all those holiday errands, getting Zsuly to her ballet and swim lessons, and trying to find a little time for myself to exercise. The cold and the dark and the bombardment of goodies, make me crave comfort foods even more, because once they are in your system, its hard not to crave more. Any kind of frittata is an easy go to, because the basic ingredients of potatoes, eggs and cheese are almost always in my fridge and cupboard. The idea of having breakfast for dinner to Zsuly is also very enticing. 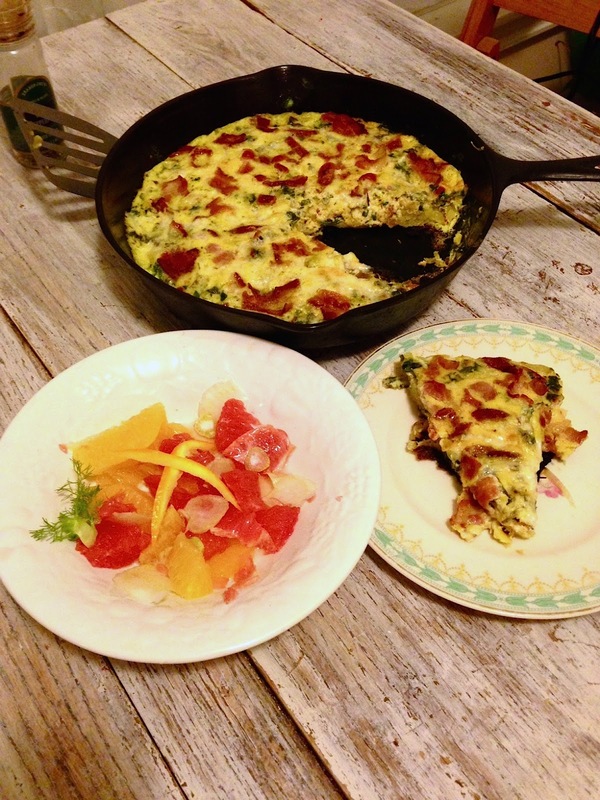 I served this frittata with a citrus and fennel side salad and 2 pieces of multigrain sourdough toast. This is a tasty and simple dish made in a cast iron skillet, that can be prepared pretty quickly. It can be served for brunch or dinner. I like to pair it with a green salad or fruit salad and toast. Doing the prep work before hand, will quicken the cooking time. Step 1: Add the EVOO to the cast iron skillet and slightly heat on medium. Add potatoes and rosemary. Stir gently as to coat all the potatoes in the oil, cover for 2 minutes or so. Stir again and add in the onions, garlic and remaining spices, and salt and pepper to taste. 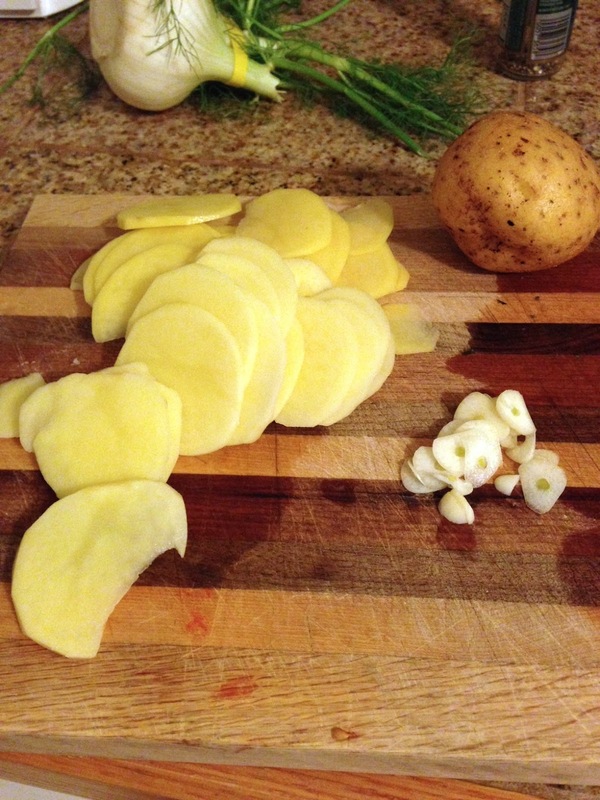 Once potatoes are done, you want them firm, but not crunchy or underdone, remove from pan and transfer to a plate or bowl and set aside. Step 2: Add the chopped swiss chard to the skillet, sauteing over a medium high heat, until soft. Remove from heat. Step 3: In a 2 cup glass measuring cup or medium mixing bowl, mix the eggs, sour cream, oregano and ground black pepper to taste. If you don’t use sour cream, the frittata will still turn out great, maybe just add a bit more additional cheese or a splash of milk. Mix the cooked swiss chard into the egg mixture and set aside. Step 4: Be sure some EVOO still remains in your skillet, if not add a tablespoon or so more. Cover bottom of the skillet with the potato mixture. Sprinkle on the cheddar cheese. Pour the egg and chard mixture over the cheese and potatoes in the skillet. Top that with the parmesan cheese and break the strips of bacon into ¼-½ inch pieces over the top. Turn the heat on under the skillet to medium heat and cover with lid. Let cook about 5-8 minutes. Remove lid and remove from heat. Take the entire skillet and place under the broiler for 5-8 minutes, until the eggs have firmed up. Remember to remove the skillet from the broiler with a hot pad. Cut into triangles and serve.